Every Saturday afternoon at about 4 p.m. a diverse group of individuals begin to trickle steadily out of the Sookmyung Women's University subway stop. As they make their way down a narrow lane off the main road they draw curious stares from shopkeepers they pass along the way. The reason is that almost none of them are Korean. 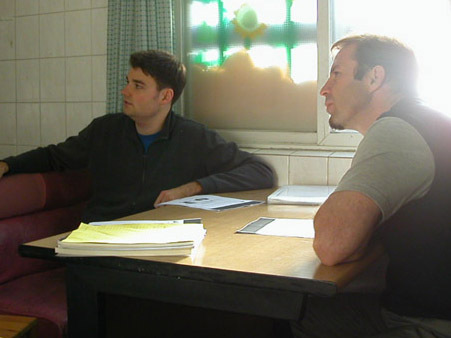 Many are westerners here teaching English or serving with the U.S. military, but there are people from all corners of the globe. Nepal, India, Myanmar, Argentina are but a few of the countries represented. 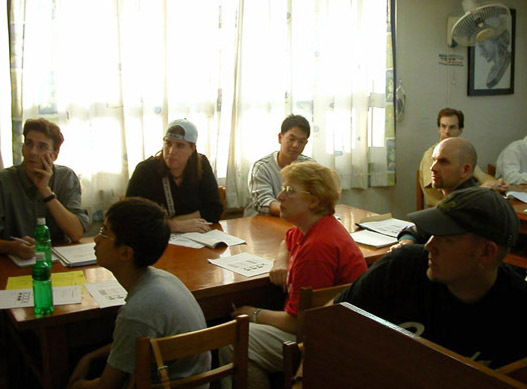 They show up every weekend to learn the Korean language, free of charge. And it's all due to the hard work and vision of a very dedicated young woman named Ms. Sunju Lee. One day while studying at the building currently housing the Study Room classes, she looked at the Koreans working hard around her and wondered why these couldn't be foreign faces staring back. With this in mind she enlisted the help of Ms. Lee and the Korean Study Room was born. "I think teaching the Korean language to foreigners is one of the best ways to introduce them to Korean culture," offers a smiling Sunju. "For someone new to Korea there is such a huge cultural gap and so much to learn about my country." 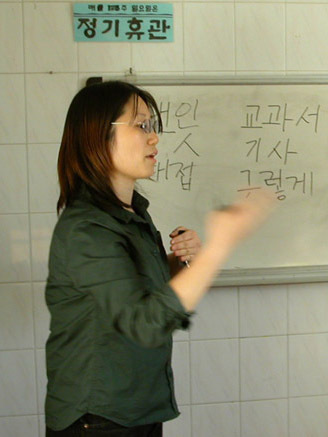 All of the teachers at the Korean study room have special training in teaching the language to non-Koreans. According to Sunju one of the biggest problems Koreans have in letting everyone else in on their language is that they simply don't know how. "Many Koreans will shower a foreigner with praise if he or she says as much as 'hello.' This may feel good but if we want to teach seriously we need a proper method." Secondly, the fact there are only four levels of classes makes it hard to find a perfect match for everybody every week, especially when there's always new people showing and others dropping out. "Each person is at a slightly different level and it's almost impossible for us to satisfy everyone," admits Sunju. Every week we have students who would be bored in say level 2, but would be way over their heads in level 3." Despite this difficulty the venture has definitely been a success. "I've had students who've made real progress since we've started and that's very rewarding," beams Sunju. And the students seem to enjoy things as well. They keep coming back in droves. Micheal is from Milwaukee, and has been teaching English in Korea for seven months now. After starting out in level one he's since made the jump up to the second level. "I've noticed quite a difference between the two levels but overall it's been a positive experience, I'm making much more progress than I would have on my own." Those interested in attending can simply show up on Saturday at 4:30 p.m. The building that houses the Study Room is a two minute walk from exit No. 2 of the Sookmyung Women's University subway stop on blue Line No. 4. Visit the website at: http://myhome.naver.com/tartan for more detailed directions and a list of phone numbers to call for more information.